I'm really excited about the extra light we are going to be getting for daylight savings. Coming home from work in the dark is always a drag, and I love it when it stays late until well into the evening. I think this is foreshadowing for the year ahead. It's the year of Optimism! Or at least it is for me. Speaking of Optimism, I was checking out one of my favorite shopping sites: shopintuition.com and found a whole slew of cute items that donate to charity with postive messages. I especially love these bracelets by Dogeared. They are only $32 and the proceeds benefit American Red Cross, hurricane relief. 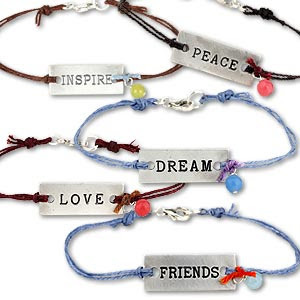 What a great bday gift for your best friend - the "Friends" version in blue is adorable. Hey Cuz! I like the bracelets, but they should take it even farther. "You look hot today," "You're so much cooler than that guy," or "I feel smarter just by being on your arm," for example. I'd be all over those.